You’ve listened to a long and complex case of murder in the first degree. Premeditated murder is the most serious charge tried in our criminal courts. You’ve listened to the testimony. You’ve had the law read to you and interpreted as it applies in this case. It’s now your duty to sit down and separate the facts from the fancy. One man is dead, another man’s life is at stake. If there is a reasonable doubt in your minds as to the guilt of the accused—a reasonable doubt—then you must bring me a verdict of not guilt. If, however, there’s no reasonable doubt, then you must, in good conscience, find the accused guilty. However you decide, your verdict must be unanimous. 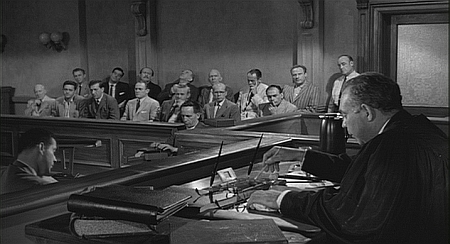 In the event you find the accused guilty, the bench will not entertain a recommendation for mercy. The death sentence is mandatory in this case. You’re faced with a grave responsibility. Mad Black Woman begins with a lavish party in honor of Charles (Steve Harris), the husband of 18 years of Helen (Kimberly Elise). He’s the recipient of Atlanta’s Jacob Frienstein Attorney of the Year Award. Life looks great for Charles and Helen but, as Helen profoundly states, “what looks one way on the outside can be a totally different matter on the inside.” Profound. Han-gi (Jae-hyeon Jo) is a pimp. He doesn’t look like a very friendly guy and it’s not surprising that, early in Kim Ki-Duk’s Bad Guy, when he sits down by and begins to study the face of Sun-hwa intently, she springs up and flees from him. An argument and then a fight ensue after Han-gi forcefully kisses Sun-hwa and she then orders him to apologize. It is difficult to imagine what Han-gi thinks about Sun-hwa when she spits on his face after a group of soldiers rough him up. What makes it so difficult to imagine is that he just sort of keeps staring at her. He’ll do a lot of that, though. Mr. Holland may not be making the impact he’d like after five months with his students, but what he holds back at school, he makes certain to deliver at home. Mr. Holland (Richard Dreyfuss) remarks solemnly about his wife’s Big News that having a baby is “like falling in love with John Coltrane all over again.” We instantly know what a perfect couple the two are because she seems not only to understand this statement but to be cheered up that it’s the only reason he looked so depressed when she told him to begin with. We should get something straight before moving on: Mr. Holland never wanted to be a teacher. This guy had dreams. He had this symphony he’d been working on for, oh, what was it? Years, maybe. So, what do you do when the Big Time isn’t panning out for you and your students are all falling asleep with their eyes open at your lectures? You get a pep talk from your wife, Iris (Glenne Headly), and get serious. When I think of a film by Takeshi “Beat” Kitano, I think of machine gun fire. The machine gun fire I picture does not, however, come from a gun but from a bouquet of freshly cut birds of paradise. That’s the sort of action film Kitano makes, though. He combines the minutiae of everyday life, its humor, and sudden bursts of intense violence into simple stories that often very attractively engulf that violence.